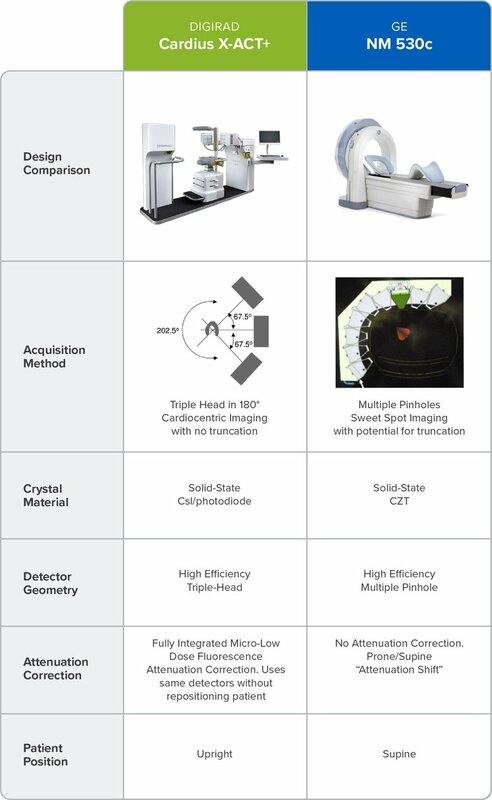 On the surface, many solid-state SPECT camera systems may look similar. But, if you compare their individual design, functionality, and features more closely, you’ll see that they can differ significantly. Whether it’s the number of detectors, the method by which they image patients, the maximum weight they can support, or the size of the imaging sweet spot, your best decision will be made by weighing the advantages and disadvantages of each model and manufacturer. We’re all familiar with the obstacles that radiotracers and subsequent gut activity presents during Myocardial Prefusion Imaging. When the radioisotope expands beyond the coronary arteries, it’s difficult to obtain quality SPECT MPI imaging of the heart. It’s a common problem that plagues many patients and physicians. So what do we do? We’ve heard of everything from half & half, cold water, and even a certain type of soda post injection to reduce the dreaded gut activity. Since we weren’t aware of any tried and true solution, we polled our fellow nuclear specialists on LinkedIn to see if they could provide some tips, tricks and home remedies. If it is a bowel loop, we give them another cup of cold water and have them walk the hallway if they can. If they have a hiatal hernia or liver disease, we give them a longer wait time prior to scan to try to avoid the need for rescan. And we ask them all not to lay down, but to sit up instead when possible when waiting. In my experience, the most effective method for reducing gut uptake and obtaining separation from the inferior margin is the combination of walking and ice cold water consumption. I have also heard of technologist giving patient’s Boost/Ensure after rest dosing and obtaining great images. This is done at the discretion of exercise stress, however. Additional cold water – approximately 8 ounces. Drink fast. Walk around for 5-10 minutes, then have the patient lay on their right side to see if the loop will pull away from the bottom half of the heart. I had a tech that worked for me that came from Ohio State, and they would try this. Sometimes it would work and sometimes it wouldn’t. Always feed them. That, of course, helps for most. We find that waiting is the best remedy but not always practical. Cold water gulped down for resting scan. Snack and a drink for the stress scan. Sometimes, particularly with hot livers, lying the patient on 2 pillows behind the shoulders, raising them will drop the activity away from the heart. I have used carbonated sodas if walking and drinking water didn’t help. I used to use Diet Sprite, but I guess ginger ale is an option too. For stress images, fatty foods, ice cream, coffee, anything that helps bowel movement. I’ve often placed a broad strip of pliable soft lead shielding over the patient’s abdomen at an angle, and this has often helped mitigate proximal intestinal activity. Otherwise, if you have the time, waiting 45-60 minutes post-injection to perform resting MPI has been fairly beneficial. I like for my patients to have a drink of their choice (soda, water, coffee, etc.) and some crackers or small snack before their stress images. Some water only before rest images. Extra wait time for Cardiolite vs. Myoview, especially for liver clearance. The portability of the Digirad Ergo Imaging System is making a significant impact in the pediatric oncology world. The Journal of Pediatric Surgery recently published an article on its intraoperative use. Most notably, it reported on how nuclear imaging with the Ergo effectively reduces the time under anesthesia and offers real-time confirmation of lesion removal. Digirad recently spoke with Dr. Marcus M. Malek of Children’s Hospital of Pittsburgh of UPMC, to further elaborate on the study. In order to guide lymph node biopsy, pre-surgery lymphatic mapping is done via lymphoscintigraphy. Adults and teens are generally able to tolerate the procedure while awake. It does, however, involve an injection and the need to remain still, which can often be difficult for a child. For that reason, young pediatric patients, and some adults for that matter, are sedated and mapped in the nuclear medicine suite and then transported to the operating room. The additional step takes a considerable amount of time and coordination, which leads to downtime in the OR. The portability of the Digirad Ergo allows the patient to be anesthetized while they’re in the operating room. Prior to the start of the surgery, the nuclear medicine technologist or physician injects the radiotracer in standard fashion. After the tracer has moved to the area of interest, the Ergo acquires the images needed for the lymphoscintgraphy. Once the sentinel nodes are marked and the area is prepped, the surgery can begin without delay. When the procedure and the surgery are done in one environment, it’s safer for the patient, spares them additional time under anesthesia, and alleviates the need for transport. Beyond reduced anesthesia time, a camera in the operating room allows the surgeon to confirm the lesion of interest has been removed in real time. Certainly, a preoperative lymphoscintigraphy can help with mapping, but it cannot visually confirm the lesion’s removal. The Ergo allows confirmation of lesion removal or, in some cases, identification of lesions that were thought to be removed or hidden behind another. Visual representation is a fail-safe that ultimately improves surgical outcome. In the past, some have equated portability with lower quality images, but the Digirad Ergo doesn’t trade one benefit for another. It delivers high-quality images that technologists say rival any static nuclear camera and its compact, portable design offers maximum clinical versatility. Read the full article, Use of intraoperative nuclear imaging leads to decreased anesthesia time and real-time confirmation of lesion removal , at the Journal of Pediatric Surgery. During the late 1990s and 2000s, many practices chose to purchase a cardiac camera. Reimbursement rates were consistent, testing volumes were high, and from both a patient care and an economic perspective, it made sense to invest in the equipment. Shortly thereafter, a series of changes in the industry made ownership more challenging. Major insurance companies instituted a cut in nuclear cardiology reimbursements, payers implemented strict imaging pre-authorization requirements, and additional accreditations became required to operate a nuclear lab. How are physicians addressing the problem? Staff Changes: Reducing the number of technologists is the obvious and first choice for physicians looking to reduce costs. If you’re seeing a drop in imaging volume, it only makes sense to have the staffing choices be based on that number. Reduce Imaging Days: If you have a camera sitting in the office it may seem like offering imaging every day makes sense, but that decision can easily drive up costs. Bundling patients and scheduling them for specific days is a way to increase efficiency. Making this move can allow you to make your technologists part-time and keep the existing team vs. letting parts of the team go. Only paying for one or two days a week is much more cost effective if volumes are down. Negotiating Lower Rates: Some practices have had success with negotiating lower rates on isotopes, consumables, and supplies. Additionally, the cost of the physicist and audits is negotiable so that can be an area to explore. The limiting factor with this method is leverage. Smaller practices that purchase a limited amount of supplies will not get the discount that larger practices may receive. Partial Outsourcing: Many physicians are turning to outsourcing and bringing in outside vendors to provide elements of the service, particularly around staffing. By not having the full-time employee obligations they can easily scale their expenses to match volume. The quality and the consistency of the technologists are critical here because the team is a reflection of the practice when they’re imaging patients. Comprehensive outsourcing is a bigger decision, but it’s one that could result in the greatest cost savings. Under a comprehensive outsourcing arrangement, the outsourcing provider delivers the staff, consumables, accreditation, radiation materials license, etc. Patients are imaged at your office, but the financial burden of operating the nuclear lab is on the outsourcing partner, not your practice. Financially this works because the provider is paid a percentage of the reimbursement, so the upside is much clearer. Image and you earn a profit, don’t image and there is no penalty. Programs such as Digirad Select provide a nuclear medicine technologist or cardiac stress technician that handles the imaging in your office, with your existing camera. Other package options include equipment, licensing, supplies, pre-authorizations, repair and maintenance, and accreditation. Comprehensive outsourcing providers, like Digirad, are able to make the numbers work largely due to leverage. By working with thousands of practices across the country, the rates they are charged are lower, and this creates efficiencies that lower costs and increase the quality of the service. Regardless of the options you choose to implement, it’s important to stay ahead of trends in both technology and the reimbursement landscape. Managing your overhead will protect your ability to help future patients as the market evolves.